1. How can I get the total (if the user selects 1 or 2 or 3 different orders). I need to find out the total no matter what the user selects and presses (ButtonDone) with the tax added. I could not figure out how to add the arrays based on the user selection. 3. I managed to get a new line for each order but everytime I select the (ButtonBurger), the menu of the order disappears and only the (Hamburger) is shown in the first line of the (TextboxBill). In other words, if the users select different orders then they select (Hamburger) at the end, all the previous orders disappear and (Hamburger appears in the beginning. (I attached the pictures for clarifying the probelm). I am totally new in programming and I'm trying to learn as much as I can. Thank you in advance for any comments / help. 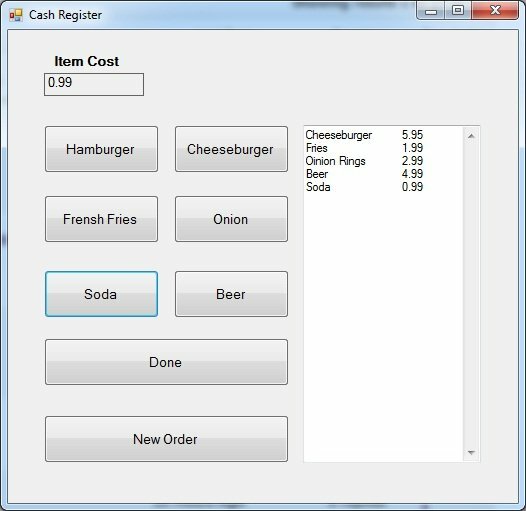 You can get total from TotalCost variabel since you already count it TotalCost += OrderMenu(1).ItemCost But you put the declaration in every buttons so you can't use it properly. You need to put TotalCost in Global Declaration and remove all TotalCost declaration in every buttons. Your code not complete like others. You missing '+' sign. How did you manage to figure out structures, string concatenation, special characters (vbTab & vbCrLf) and not know how to clear a textbox or can't figure out that you are clearing whatever existed in textboxbill by not concatenating the new value to the old one? I meant by clearing the textbox was clearing the 'array' and start from the beginning with new order. Here in the code that I wrote, every time I clear and start new order, it gives me the total of the "previous" one + the "new order" that I placed. I'm still figuring out how to do that. I went through all the suggestions but in the last part, I'm still having problems in 'clearing' the array and start new order. Yes the command that you provided clears all the strings but when I start new order (ButtonNewOrder) the previous output (TotalItems) is saved and added to the 'New' (TotalItems). I will keep looking for a solution and I will post it with the corrected code if I'm done. ChrisPadgham already answered it. just put that the code in button new order event. Once again, I appreciate the help and thank you for your comments. Help With Sudoku Code Problem ! !